Character Traits for 1st Graders!!! Character Trait for 2nd Graders!! 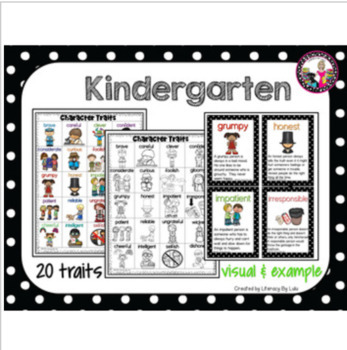 Character Trait Kit for K-5! School-wide Approach! 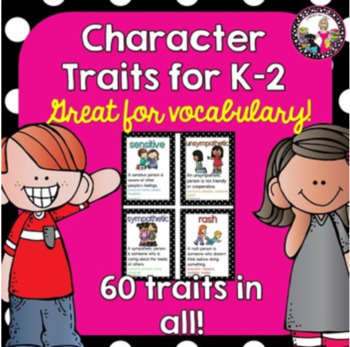 Looking to expand your kids' knowledge of character traits and vocabulary? This product can be used in K-2 grade classrooms or in a primary school committed to raising the level of academic language and vocabulary! These traits come from Patrick Manyak (2007) in an article in The Reading Teacher where he advises teaching character traits in a school-wide approach. Every grade level he suggests should be responsible for teaching 20 traits. The traits listed here he recommends for k-2. What I have done is taken his list, added pictures to illustrate meaning and then on the mini-cards, have provided somewhat of an explanation or an example. On the first and second grade cards there are synonyms. These then can be added to a bulletin board as you have taught them. You could also make a trait word wall! This would be a great way to start a school-wide approach by having k-2 or keep them all for yourself. You can mix all the sets. 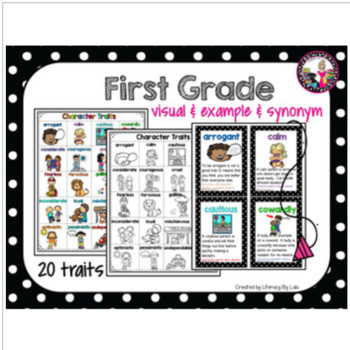 The one sheet of traits (8.5 x 11) can be printed and laminated and given to each student to keep in his/her reading and writing folder as a reference. As far as the cards, I would use them in conjunction with your read aloud and the “Tracking Traits Across Texts” chart. Each time you finish a fiction read aloud, you can chart the main character from the story, list the predominate trait of the main character, indicate whether the trait caused or solved the problem and then find examples from the text to help further illustrate the meaning. The demands of the CCSS ask kids to stay within the four corners of the text to cite evidence. This chart will help to model that! Also, to help kids understand traits, it may be a good way to start by identifying their own traits. Included is a sheet for your kids to do that plus give supporting evidence from their own life. 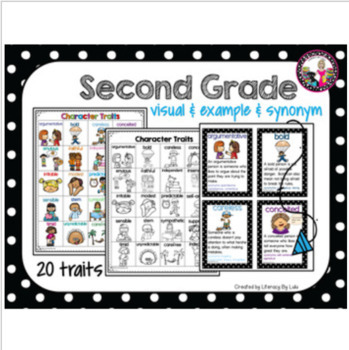 There is also a character trait sheet that you can have your kids use to identify traits of characters in the books they are reading AND supply the evidence from the text. As part of a bonus, I have included blank cards for you to add additional traits and your own clip art. A fun idea would to be to take a photo of each student, insert it into the template, and either have the student write or you type on the template their trait and evidence. This could be an adorable addition to the word cards. The class book is essential the same idea as the cards but the kids can illustrate their trait and then supply the evidence or you can also insert a photo onto the template and then have them write the evidence. Once the class book is complete you can have kids take turns bringing it home to share with their families and then house it in your classroom library. Two covers are available; color and black and white for you to type your class name, school, and year. Remember, you need to explicitly teach the traits. This can be done through acting out, providing synonyms, or finding them in context. Also, making them part of your speaking vocabulary will definitely help to make them stick! Whatever you choose to do, your kids' vocabulary will improve. I hope you will consider following me for freebies and product updates! Character Traits for Kindergartners! Great for Vocabulary! Character Traits for Second Graders!